Henry Page has never been in love. He fancies himself a hopeless romantic, but the slo-mo, heart palpitating, can't-eat-can't-sleep kind of love that he's been hoping for just hasn't been in the cards for him -- at least not yet. Instead, he's been happy to focus on his grades, on getting into a semi-decent college and finally becoming editor of his school newspaper. Then Grace Town walks into his first period class on the third Tuesday of senior year and he knows everything's about to change. 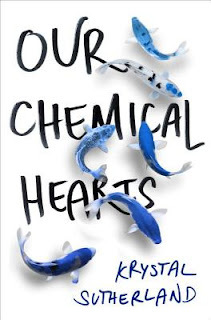 Add your review of "Our Chemical Hearts" in comments!